Edmentum, a leading provider of web-based learning programs, is pleased to announce that the International Society for Technology in Education (ISTE) recently awarded a Seal of Alignment for Readiness for Edmentum Exact Path. Exact Path utilizes adaptive diagnostic assessments paired with targeted student learning paths to ensure academic growth in K–8 reading, language arts, and math. This seal recognizes Exact Path as a highly effective resource for successfully acquiring knowledge and skills that are foundational to the globally recognized ISTE Standards. With Exact Path, educators can pinpoint each learner’s ability level using Edmentum’s adaptive diagnostic assessments. High-quality digital curriculum engages different learning modalities, and expert design contributes to building foundational technology skills necessary for success in the digital education age. “Exact Path combines the power of a computer-adaptive assessment with high-quality digital curriculum to ensure students are building critical academic skills in an online environment that embraces 21st century teaching and learning,” said Christy Spivey, Edmentum’s vice president of curriculum and assessment development. The ISTE Seal of Alignment program can help educators find resources that support the authentic and appropriate integration of education technology in the classroom. Seals are earned only by resources that have passed rigorous review by ISTE’s review team made up of leaders and experts from the fields of education and technology. 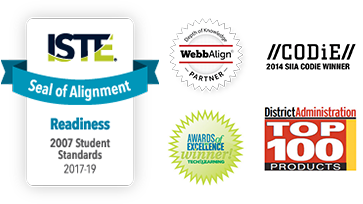 The ISTE Seal of Alignment program reviews and recognizes resources for their alignment to the ISTE Standards. Products and services submitted to the program undergo a rigorous review by a panel of standards experts and are evaluated based on the extent to which they build the skills embodied in the standards indicators. The Readiness seal of recognition is for resources that focus on learning to use technology and that help build the foundational technology skills needed to support the ISTE Standards. Edmentum, Inc., is committed to making it easier for educators to individualize learning for every student through simple technology, high-quality content, and actionable data. Founded in innovation, Edmentum’s powerful learning programs blend technology with individual teaching approaches. Edmentum is committed to being educators' most trusted partner in creating successful student outcomes everywhere learning occurs. Built on 50 years of experience in education, Edmentum programs currently support educators and students in more than 40,000 schools nationwide. For more information, visit edmentum.com.